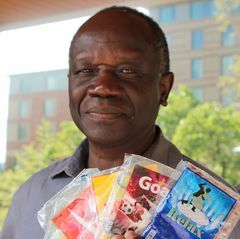 UCLA Extension’s Ochan Otim grew up in Uganda, which since its two-decade civil war has seen many people driven to drinking to alleviate their suffering. Vikash Singh was selected for the 2017 UCLA Global Citizens Fellowship and is using the $5,000 award and his medical technology background to turn an idea into action. “Meleko Mokgosi: Bread, Butter and Power” opens Feb. 11, 2018 and runs through July 1. “Lineage through Landscape: Tracing Egun in Brazil by Fran Siegel,” a large-scale multifaceted drawing installation by Los Angeles-based artist Fran Siegel runs July 23 through Dec. 10. The researchers concluded that the UNAIDS approach would not be practical because it would require finding and treating a very large number of people in remote areas. South African prisoners, sickened miners and others whose human rights have been violated are gaining access to justice, thanks to a UCLA School of Law program that offers full scholarships and training to African lawyers who then take up their cause. Impoverished locals in Mai Adrasha panning for tiny flakes of gold have dismantled much of what in other parts of the country has been preserved as tourist destinations. In a study of rural communities in five countries, researchers found that women provide far more hours of care in their daily lives than do their male counterparts. The photographs in capture a cultural movement that has been inspired by Jazz-era America and Europe to both South African dance styles and American hip-hop.